Here is the first drill in a series of breakout drills that lead to either 1 on 1 or 2 on 1 drills. This drill starts with a simple breakout. The forward will dump the puck below the goal line and then skate to the boards and open up for a breakout pass. The defense will start on the dot, skate up a couple of strides, then transition back to retrieve the puck dumped in by the forward. The defense will "wheel" around the net and make a breakout pass to the forward. 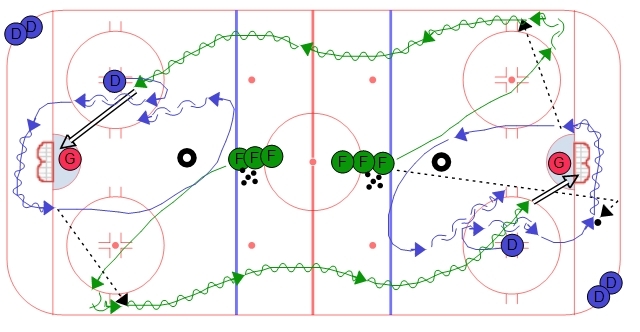 The forward will retrieve the pass and then skate towards the other end and take on the other defense in a 1 on 1. The defense on each side will make the breakout pass (with the emphasis on a good first pass) and then skate around the cone, close the gap, and take on the forward from the other end on a 1 on 1 situation. I like the simplicity yet effective drills. The ability to watch the play is a huge bonus.